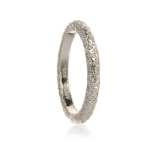 Stacking Rings are certainly on-trend. We house gemstone stacking rings, shimmer stacking rings, hammered bands and swarovski band rings. Addictively collectable; wear alone or stack different styles and colours to create your own personalised look.